Have you been going back and forth between a few different EMRs but haven’t found your favorite yet? We know how you feel, which is exactly why we started Atlas.md. We wanted to share the excitement we felt when we created the EMR, which is why we’re proud to talk about the importance of trying an EMR before you launch your practice. By trying Atlas.md for free until you launch, you can ensure that your big day will be a big deal for the right reasons. 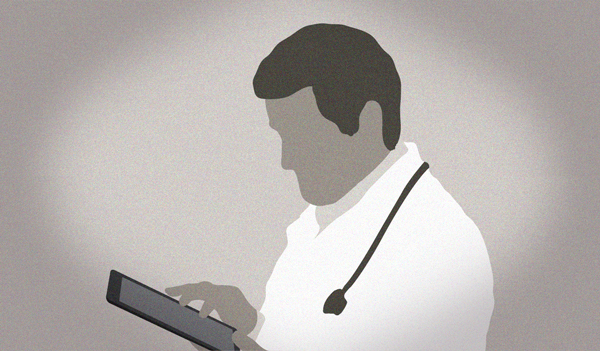 Get an EMR that lives in your browser – no fancy software. No confusing interfaces. This is an intuitive EMR that makes client communication, billing, tracking, ordering, and filing possible so that you can make all better possible. Communicate where your clients are – You can tweet, email, call, or text your clients right from Atlas.md. That means you’ll be able to communicate with your clients as soon as they need you. Make managing your practice possible – With Atlas.md, you can request, file, and ship prescriptions, you can bill your patients directly, set up automatic appointment reminders, manage your clinic’s schedule with an easy-to-use syncable calendar, and keep track of patient records. Pre-enroll before your launch – Pre-enroll patients before your launch so that, when you open your doors, you’ll have patient data and scheduling information in place. Organize before launch – Get used to scheduling, tracking, or communicating with patients before the big day. Get the lowest billing rates in the industry – Accept automated payments, credit card payments, and ACH payments. No 3rd party needed. Get Validic capabilities – Sync up with your patients’ health wearables so you can explore your patients’ daily activities with one click. Need more reasons to try Atlas.md’s? Check out our forum to see what everyone’s been talking about, or check out our features page to see what the big deal is. Proud to Work on Christmas. It’s Christmas Day, and pretty much everyone you know is spending time with family and friends. They’re opening presents, attending a church service, sledding, and lounging by the fire after another giant meal. But you experience holidays a little differently. You’re hanging with your family and partaking in all the usual holiday traditions, sure. But you’ve had one eye on your phone all day, and not because you’re a social media addict. You see, as Jack was opening presents he sliced his finger open with the scissors. Rather than spending the rest of the day sitting in the ER and stressing over the money that would have cost, he called you. You met him at your office and stitched him up – in just a few minutes, and for just a few bucks. He left with a big smile on his face; an hour later he sent you a picture of his young son sailing down the hill on his new sled for the very first time. His text said he’d have missed that moment if it weren’t for your quick action and availability. Across town, Jill was shuffling her family into the car on the way to brunch when she slipped on the ice. Her ankle swelled up in a hurry, but not before she punched in your phone number. After walking her though a verbal questionnaire about her symptoms and the severity of the fall, you were able to determine it was just a sprain and that some Ibuprofen would do the trick. Jill let her husband take over the shuffling, and while kicking her feet up after brunch as you instructed, she and her daughter had a fantastic conversation that might not have happened if Jill had been ultra-mobile as usual. In the Swinkle home, Grandpa Bob snuck into the pantry and devoured the rest of the jalapeño sausage… which gave him instant heartburn. When he confessed to his thievery, his daughter called you immediately to make sure the heartburn relief pill she planned on giving him wouldn’t interfere with his other medications. You reviewed his chart, did some cross referencing, and advised her to stay away from that particular heartburn relief pill. Instead, you recommended one that wouldn’t interfere with his existing med list – saving him a trip to the hospital later, and possibly even his life. So yes, you are a teeny bit distracted today. But you’re grateful for the chance to care for your patients. Thankful for their trust. You might get a few calls on Christmas that pull you away from the holiday task at hand, but you wouldn’t have it any other way. They’re family, too. Your patients needed you, and because you truly understand the value of Direct Care, you were there for them today. Today and every day. Merry Christmas to all you Direct Primary Care warriors. May you be ever reminded of the value you offer your patients, the medical community, and society as a whole. We did it back in June, and it felt so good that we decided to do it again. That’s right – just in time for the holidays we’ve dropped credit card transaction fees from 2.5% way down to 2.1%. More money in your pocket, right when you need it most! Remember the days when 3.1% was the norm? You probably didn’t really even notice it… after all, that’s what you’d come to expect. But in dropping it to 2.1%, we’re showing you just how committed we are to helping Direct Primary Care succeed. And just like DPC promotes in every detail of its model, we want the recipients of its care to expect better. It’s a two-fold result, really. On the one hand, clinics who use the Atlas.md EMR know without a doubt they’re getting the most bang for their buck and that Atlas truly cares about saving money where it counts. And on the other hand, those same clinics are in an even better position to pass the savings on down to their patients. Just like that, everyone wins! So you see, it’s more than lower numbers. With them come higher expectations and higher satisfaction. Three Ways Your Direct Care Practice Can Tell A Better Story. Part One: What You Do Matters. As a Direct Care practitioner, you’re doing so much more than practicing medicine. You’re telling one of the most important stories our country, and perhaps the world, needs to hear today. You’re telling the story of happiness. Of freedom. Of satisfaction. Of care. Your story paints a picture for healthcare patients. This picture isn’t abstract nor is it intangible. It’s vivid with color, the depth of its honesty and transparency reaching into their souls and telling them that better is possible. If you offer same day scheduling, make it happen. Remember, your patients are probably used to waiting three weeks for an appointment, spending an hour in the waiting room, and then being shuffled right back out the door 10 minutes later. You can show them they don’t have to put up with that nonsense for another minute. Respond in a timely fashion. You’ve chosen to keep a limited patient count in order to make time for everyone. So since you don’t have back to back to back appointments scheduled 15 minutes apart, you likely have some form of downtime throughout your day. Use it to keep on top of patient correspondence. 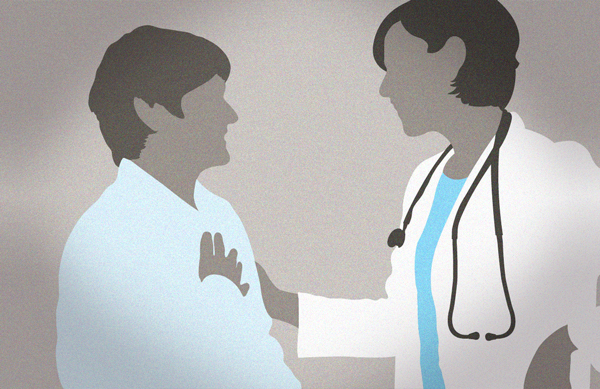 You might have six patients to deal with in one day, but they’re only concerned with one doctor… they want to know they’re just as important to you as you are to them. A simple response can go a long way to prove that. 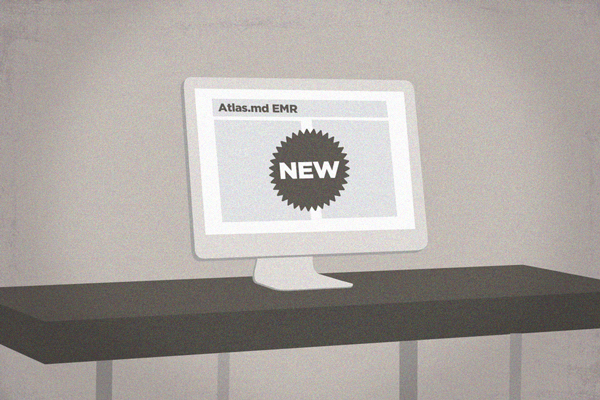 What’s New in the Atlas.md EMR? Multiple Locations! The Atlas.md EMR has always been poised to scale gracefully alongside your practice, but now we’re stepping things up in a big way. We’re thrilled to announce the newest feature of the EMR, which fully supports multiple practice locations. We’re talking management of multiple offices, several doctors and staff members, and efficient movement of patients as you transition them from one location to another. You probably won’t notice the launch of this new feature unless you’re opening a new location firsthand. But we’ve taken great care to integrate location-based details throughout the entire EMR if it pertains to you. Some of the biggest perks of this new feature include assigning doctors to a specific location, which automatically assigns their patients to their location as well. Each location has its own specific inventory, so when you dispense for a particular patient, that action will respect the location the patient is assigned to. But don’t worry, you’re not responsible for remembering all this. We’ve set up prompts and reminders so when you take an action that will affect another location, you’ll know exactly what to do. Who says DPC doesn’t work with specialties? Generally, I was seeing more complex cases of heart disease compounded by obesity, metabolic disorders, and poor lifestyle. Trying to manage or at least give advice to patients was getting more complex and time consuming. In addition, the advent of advanced labs with inflammatory, oxidative, and genetic markers was taking more time to analyze and offer advice. Phone calls for pre-authorization first for invasive procedures, then for nuclear procedures, and now for just echocardiograms waste more and more time during the day. They say that if you love what you do, you will never work a day in your life. I was finding that what I was doing was starting to feel suspiciously like work. He describes his activity with some of his patients as “the four minute smile” because he had to dart in and out of appointments that quickly just to stay on time. Unfulfilled and well, rushed, Dr. Kahn knew there had to be a better way. But he didn’t want to just follow suit of others around him who had thrown in the towel on medicine. Instead, he created his own solution and in turn his own opportunities. So what does his “after” look like? We can’t wait to find out, but we imagine he won’t be sorry to leave “the four minute smile” in the dust. 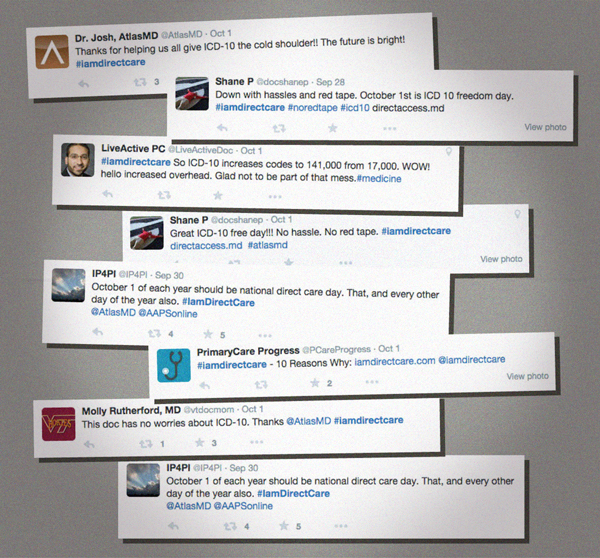 The New ICD Billing Codes Have Launched… But We’re Still Celebrating! Some establishments are still scrambling to make ICD ends meet. Some are just trying to recover from the bumps in the road uncovered during the October 1 launch. But Direct Care practices around the country reported smooth sailing so far – and even had some time to show off their support for DPC! We’ll continue to celebrate freedom from red tape and billing codes – you can, too! 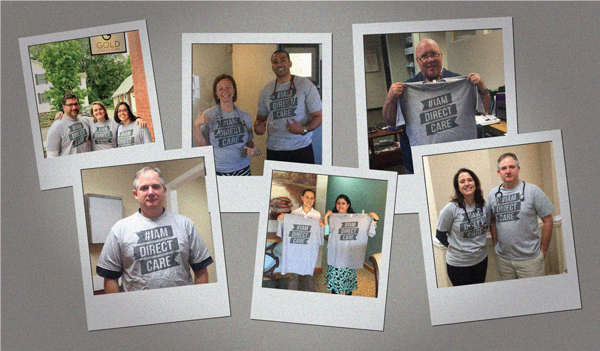 We’re still offering #IAmDirectCare T-shirts so you can wear your support all year round. We even heard some patients wanted shirts! Now that’s a party. Get yours over here, and see how Direct Care looks on you! Cheers to happy docs and happy patients. The Pen and Paper Era was Accident Prone. How is Medical Tech Better? When you look at those stats, it’s no wonder the industry couldn’t wait for a better way. Technology has done so much good in the way of standardization and reducing the margin of human errors. EMRs and the like have made it easier for docs to spend less time charting and more time actually with their patients. The benefits far outweigh any negatives, but that’s only if you use technology responsibly. We can’t leave our jobs totally up to technology, as the story over on Medium.com illustrates perfectly. If we do, we’ll miss things like a massive accidental overdose (patient needed one pill, got 39 instead) and nobody wants to feel the guilt Nurse Levitt experienced so intensely. We’ll miss dangerous drug interaction warnings and potential allergy notifications. We’ll miss the opportunity to avoid life-threatening situations. Whether we’re in a hospital setting, or a clinic setting, this kind of attention to detail still matters. Immensely. We know this. And we, as Direct Care professionals, have adopted a business model that wholeheartedly embraces the very two things that can prevent errors like this from happening — even in the technology era. 1. We’ve gotten rid of red tape and policy that does nothing but convolute the simplest of tasks. In fact, we’ve taken it upon ourselves to build the EMR that we want, and have thus turned it into a product incredibly useful for hundreds of other Direct Care practices, too. It’s based on accuracy, simplicity and ease of use. There are people working around the clock to make sure these things work together in tandem. 2. We have time. Time to think through every prescription we order and dispense. Time to double check dosage. Time to actually pay attention to the alerts that fire when an irregularity has been electronically recognized. This gift is not something we take lightly. Technology can certainly make our jobs — our lives — easier and more efficient. For that we’re thankful on a daily basis. But we mustn’t forget that we are the threshold for which all medical decisions must pass. We can’t check common sense at the door in lieu of an app that thinks for us. And because we have a business model that allows us to work to the best of our abilities, we love our jobs… and therefore don’t want to just go through the motions. So thanks to technology, for all you do for us. But more importantly, thanks to Direct Care, for existing so that we may also operate as the best versions of ourselves.